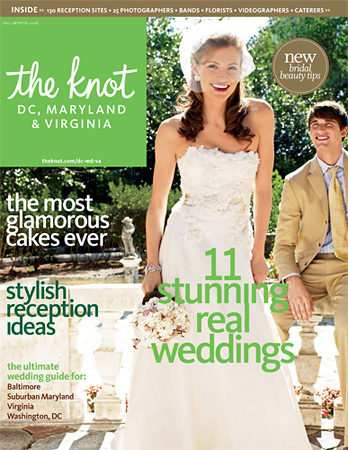 In Part 1 we shared the feature on Keri & Andrew’s Wedding in DC/MD/VA regional edition of The Knot magazine for Fall 2008. Our work actually appeared twice in the mag and we challenged our readership to find it. 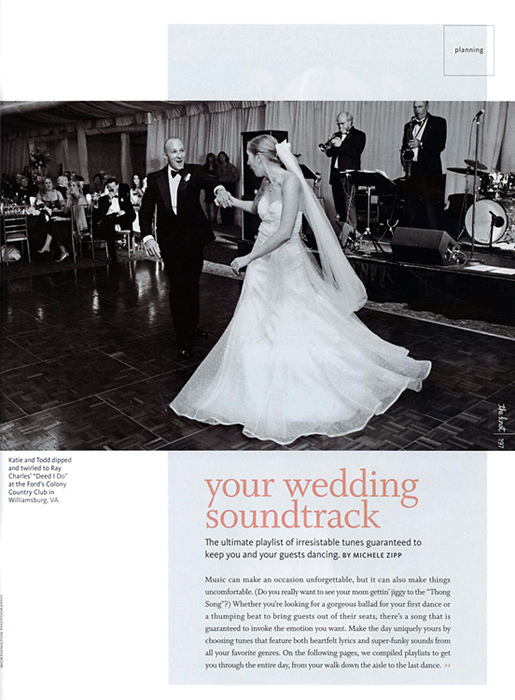 A photo from Katie and Todd’s first dance was chosen as the cover image for the article titled, “Your Wedding Soundtrack” by Michele Zipp on page 197. Here’s the mediocre scan from the mag that we made on our fax machine, the spread looks a lot better than this! Katie and Todd had a beautiful fall wedding on the grounds of Ford’s Colony Country Club in Williamsburg, Virginia last October where they both danced the night away. On the way home, Sam told me that when he was 12 of so, his father told him that if you want to be popular with the ladies, all you have to do is learn how to dance. Like most good advice passed down from parents to their pre-teens, it was tagged with “my dad is wrong” and filed in the back of the rolodex of wisdom. Which is too bad, because his dad was very right. So back to lucky Todd, who could dance with any lady in the room, but got to swing around with the prettiest one to Ray Charles’ “Deed I Do” during their first dance as husband and wife. Congrats to Katie and Todd for catching the editor’s eye at the Knot. I think you can tell from just one photo how much fun the rest of the night was too!